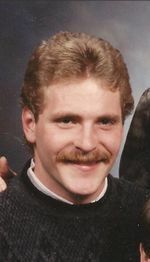 Michael L. Stuart age 43 of Ashland, passed away on July 6, 2010 of natural causes. Born in Ashland on March 19, 1967 the son of Donald and Cathleen (Dolby) Stuart he was an Ashland resident all of his life. Mr. Stuart was an employee of Guenther Mechanical Inc. for 24 years. Michael is survived by his father, Donald Stuart of Ashland, one sister and brother in law, Michelle (Jim) Coy of Ashland. He is also survived by nieces and nephews, Andrea, Dustin, Jordan, and Mariah. Michael preceded in death by his mother, Cathleen on July 21, 2006. He is also preceded in death by his grandparents. Michael was a member of the Red Haw United Methodist Church. Michael was an avid motor sports fan and loved serving as the crew chief of the 5M dirt late model with his friend Ryan Markham. Funeral services will be held on Friday July 9,2010 at 11:00 a.m. at the Heyl Funeral Home with Pastor Butch White officiating. Friends may visit with the family on Thursday July 8, 2010 from 6-8 p.m. at the funeral home.